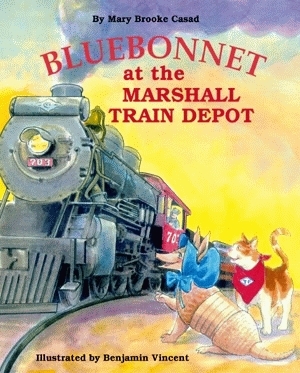 Bluebonnet, the travelling Texas armadillo, shows children the fun of exploring new places as she tours the Marshall Train Depot and learns about its history. When Bluebonnet arrives in Marshall, she bypasses the beautiful “Wonderland of Lights” festival in search of something more interesting to her—the historic Marshall Train Depot. Once there, she meets a friendly local cat, T. P., who explains that he is named for the Texas & Pacific Railroad. T. P. and Bluebonnet tour the depot and learn about its history, all the while developing a charming friendship. At the end of the tour, the two friends boldly leap onto a train and head off together for their very first train ride. Mary Brooke Casad is a Louisiana native and a resident of Texas. She received a BA in journalism from Southern Methodist University and is the author of Pelican’s Bluebonnet at Dinosaur Valley State Park, Bluebonnet at Johnson Space Center, Bluebonnet at the East Texas Oil Museum, Bluebonnet at the Marshall Train Depot, Bluebonnet at the State Fair of Texas, and Bluebonnet at the Texas State Capitol. 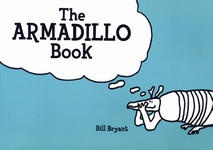 Casad created Bluebonnet, the well-traveled armadillo, to teach Texas children about their rich local history. Benjamin Vincent is a freelance illustrator based in Dallas. He also illustrates for magazines and advertising agencies, creates vision drawings for corporations, paints, and is a well-known caricature artist. Vincent, the illustrator of six of Casad’s Bluebonnet Series books, received a BA in illustration from the Art Center College of Design in Pasadena, California.